Steve Jobs the film comes with some hefty pedigree and baggage partially due to its real-life subject, Steve Jobs the man. Meant as a sort of a spiritual follow-up to the also true life but highly fictionalized/stylized The Social Network, famed screenwriter Aaron Sorkin has crafted the enigmatic life of the titular Apple co-founder, based on the authorized biography by Walter Isaacson, into a tightly structured character study expressing all the madness and methodology of a visionary technologist. Under the stylistic direction of Danny Boyle, it's a film filled with highly entertaining personal contradictions and Sorkin's trademark writing/dialogue. Taking place before three separate and different product launches and time periods in 1984 (the Macintosh), 1988 (NeXTcube), and 1998 (iMac) represented through distinct filming formats (16mm film, 35mm, and digital video), Steve Jobs has all of Boyle's trademark kinetic energy and dazzling visuals as he injects various scenes of walking and talking in and out of theatre hallways with stylistic flair and wit. What Michael Fassbender captures so well as Jobs is his elusiveness and complete arrogance. Sorkin moulds the film around a father and daughter story mirroring his own and Boyle's paternal feelings. Lisa Brennan-Jobs, Jobs' estranged daughter is portrayed by three actresses at different ages (Makenzie Moss, Ripley Sobo, and Perla Haney-Jardine) and their often tumultuous relationship along with Lisa's mother (played by Katherine Waterston) are firmly at the heart of the narrative putting all his ambition and drive into a greater human context. What makes the unconventional, semi-biographical film so compelling, despite the limitations and repetitive nature of its somewhat contrived real-time three act structure across time periods, is the repertory cast of actors playing the same characters at different ages. Kate Winslet is essential and remarkable as Joanna Hoffman, Jobs' closest collaborator and head of marketing, who gives a window into his madness as one of his few challengers and loyalists. Seth Rogen does fine dramatic but still charming work as the affable but occasionally combative Apple co-founder, Steve Wozniak (who was a consultant on the film). Jeff Daniels and Michael Stuhlbarg also pitch in with superb supporting turns playing both aids and foils to Jobs' distinct vision as former Apple CEO John Sculley and original Mac team member Andy Hertzfeld. 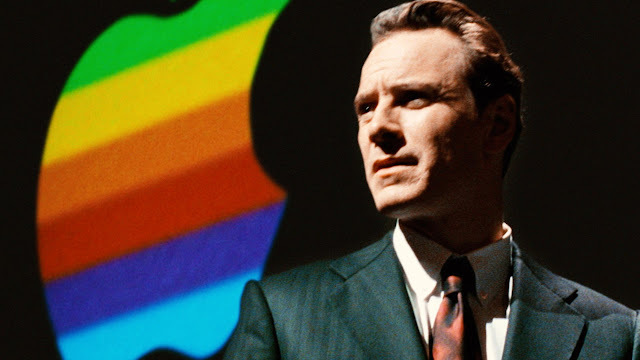 Instead of just further mythologizing Jobs into our greater popular culture, Sorkin and Boyle make Steve Jobs a complete cinematic and theatrical experience full of all the expected Shakespearean drama and intrigue you would expect from such a dominant, influential cultural figure. Fassbender is able to both shed and reinterpret the popular image of a man so ingrained in our public consciousness through expressing reimagined versions of his trademark product launches. Steve Jobs the film is remarkably able to think differently about Steve Jobs the human being.